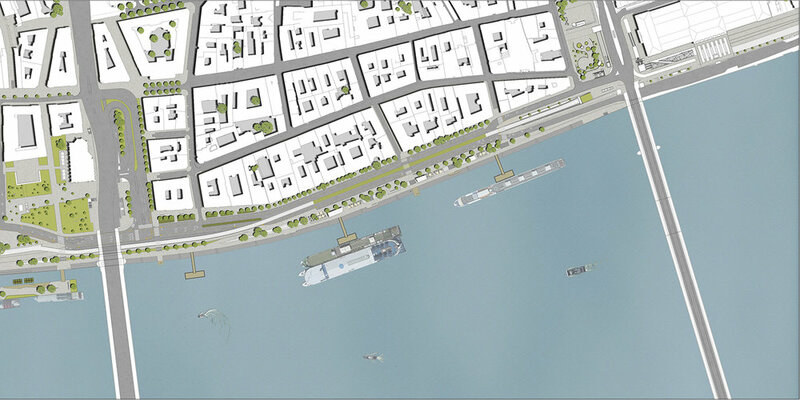 By commission of the Municipality of Budapest, our design studio is the lead designer of the project ‘RAK-PARK - Complex regeneration of the Pest-side Danube waterfront’. 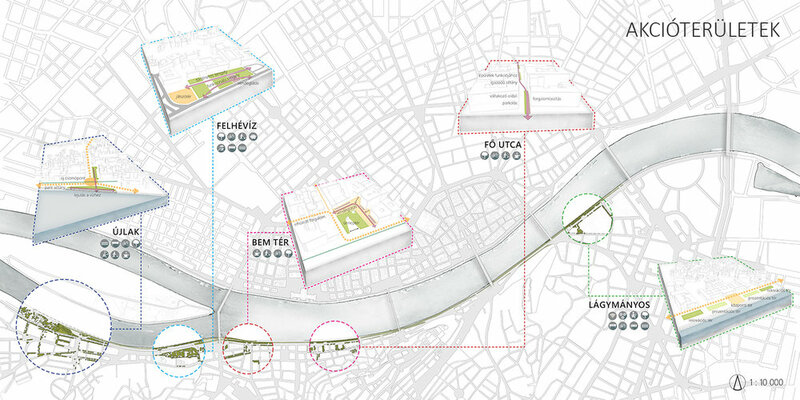 The design area covers the lower embankments between Kossuth square and Fővám square. 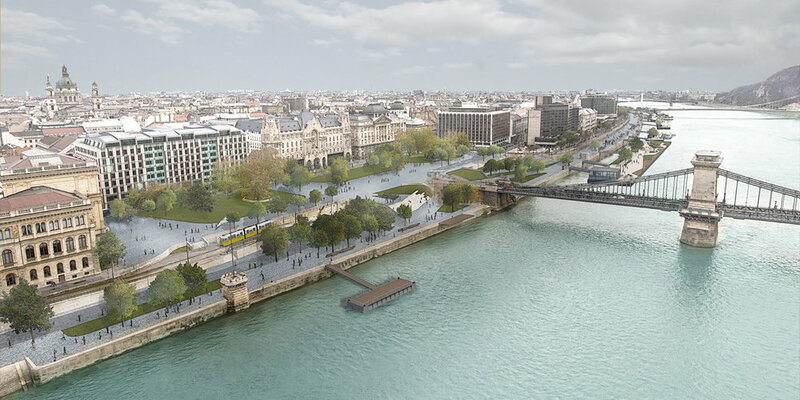 The aim of the project is to create a renewed, well-functioning and continuous public space with a unified image, along with the elimination of the elements responsible for the present chaotic state of the embankments (damaged/missing paving, unevenly placed barriers, arbitrarily placed advertising boards, car parks and waste storage). 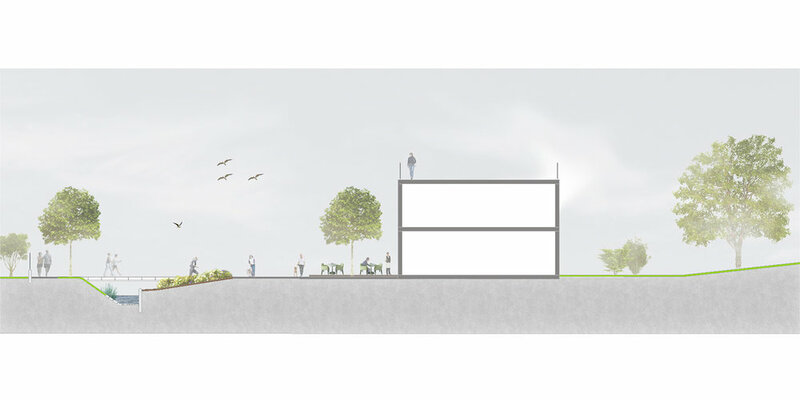 · expansion of vegetated areas. The design area was divided into three different areas based on appearance and function in conceptual phase. The first one is the Id. Antall József embankment, where an intensive and representative verdant area is designed on the basis of the present conditions. The walkway runs tightly along the waterfront, and is safeguarded from the road on the adjacent side by a wide green surface. The Jane Haining embankment becomes a broad urban promenade with a dominance of paved surfaces, and scattered groups of trees to provide shading on hot summer days. 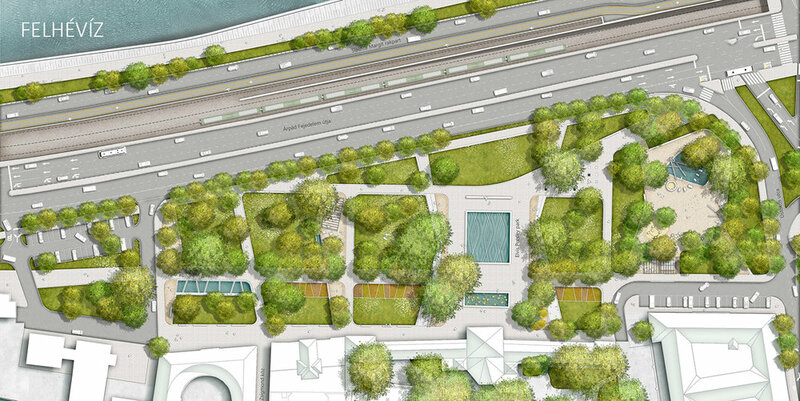 On Belgrád embankment, car parks on top of the International Landing Stage transform into vibrant recreational terraces and cafés in the scenic panorama. At this section we also designated a water proximity service zone with cafés and restaurants, where the former ship docking function of the embankment can harmoniously coexist with its new recreational features. Human Construct Tervező és Szaktanácsadó Kft. Our priority was to create multifunctional spatial foundations for social, economic, and environmental growth in Püspökszilágy. The reconstruction of built and natural elements of the square increases life quality in its immediate surroundings, and therefore attracts high quality services that take this growth even further towards functional diversification. Another intent of our spatial design concept was to establish individual square-segments where community life can take over public space. We avoided enforcing specific uses on these public areas, and aimed to provide a transformable setting for various recreational and cultural activities. During the planning process, we also focused on creating spaces suitable for summer school and camping programs held in the settlement. 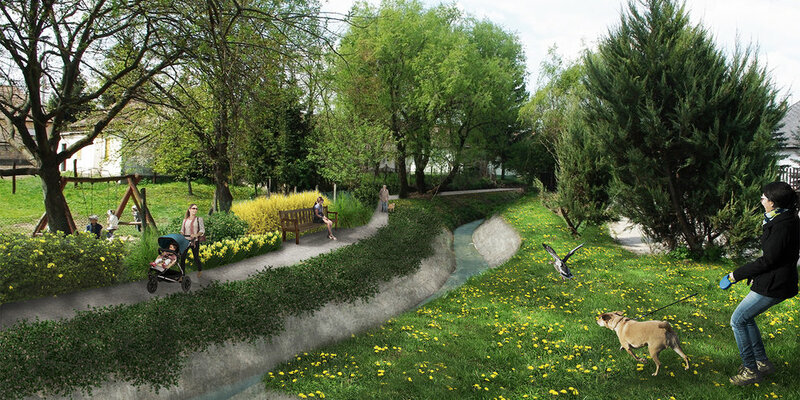 We aimed to enrich the town center with features that help getting acquainted with nature and our environment. 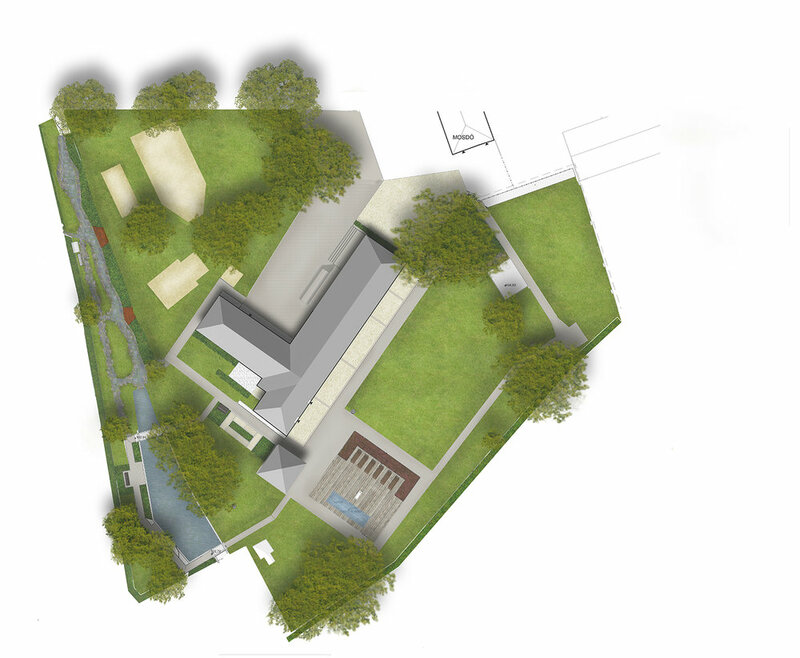 The design area was divided into five functional units, which are streamlined by the settlement’s creek. Information boards are laid out within each unit and at important sights to add an educational feature to the path that follows the stream from one green space to another. Embankments – as primary meeting zones of the river and the city - were originally constructed around the world as quays, and therefore were bases of freight forwarding and trade. Bustling, loading, litter, shouting, and hard work characterized these places. After the passing of a century, the expectations and demands of the embankments took a 180° turn: tranquility, water proximity, neatness, peaceful areas of recreation and relaxation are what inhabitants seek on waterfronts. 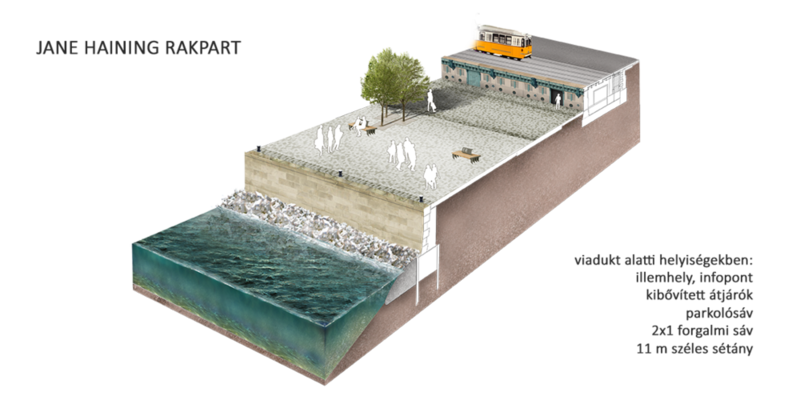 As part of our design concept we put a great emphasis on the preservation and enhancement of the scenic views along the Danube waterfront. We aim to justify this ideology by installing transparent and puritanical architectural elements. Encompassed by a flexibly integrated traffic system, the establishment of a pedestrian and cyclist-friendly network was a top priority. We strived to develop a space in this coastal zone with strong links to its historical heritage. 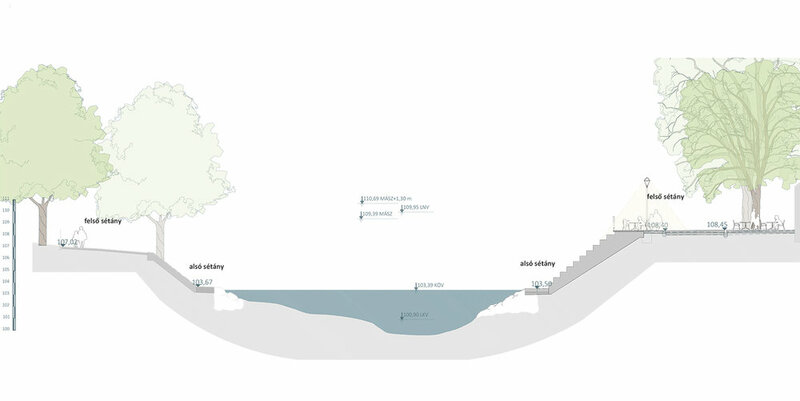 We imagined our floating systems with flexibly transformable, simple technical designs to improve water accessibility. In order to create a uniform image and orderly public spaces, we applied a new paving system and street furniture family, which are tied into one entity by well-maintained verdant spaces. Based on our design program, we were commissioned to create an enclosed area accessible with entrance tickets only. We also felt it essential to strengthen the relationship between the English Garden and the city, and therefore we provided a pedestrian path to the Greenhouse from Erzsébet királyné square. By widening this path at its southern entrance, we created a smaller gathering place in front of the gates. The main entrance opens from this clear, newly constructed space. Visitors can access the parj through a reception building that aims to reflect contemporary architectural ideology. The first features visitors meet are the schematic mill structures installed within the former Crystal Springs area; these structures playfully demonstrate the operation of full-sized mills. Visitors are welcomed by the distant sight of Jenő mill upon entering the park. Located at the far end of the site, it provides visitors the experience of a fully functional working mill. Leaving the area is possible on two routes; either via the reception building towards the city or the English Garden, or the other exit route connecting the area to the western part of the English Garden via the swing gate behind Jenő mill. The most fundamental spatial organizer is the contour of Malom-ditch, its original outlines are reflected in our base plan. The ditch cannot be restored to its former status due to current property lines, water levels, and receptors, yet its contour is indicated with distinctive lines in both paving and green surfaces. Since most visitors will be children, the bottom depth of the ditch is reduced to 0.6 m for their safety. 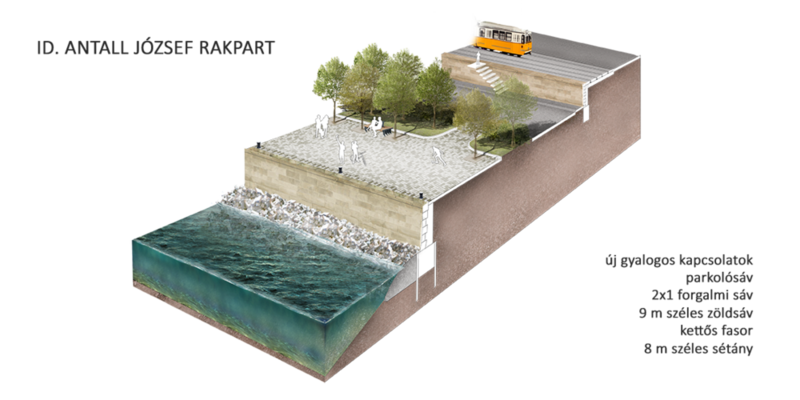 The sidewalls of the ditch are made of stone, waterproofing is provided by plastic membrane. The pebbles in the basin are similar to those used at the recently restored park. The models of several water mill driving structures typical to the region (underpinned, waist-grooved, overturned, canary mills etc.) are presented on a new island in the trench. The island is located in the middle of the 17 m wide Malom-ditch, which follows the typical form of islands that formerly supported the wheels and water steering structures of water mills. Children on this surface can manually lift water from Malom-ditch into a small stream running through the middle of the island. This stream can be controlled and directed to activate various milling structures in the stream system. The island and the 'main land' is connected by simple pedestrian wooden bridges. Models of mill structures are also located along the outer edge of Malom-ditch, with their outer appearance fully proportional with an approx. 40% reduction. Reduced mill structures include a variety of mill types available in the city (loafer, cutter, saw types), that children can learn about in a playful manner. The mill structures can be operated freely by the children. 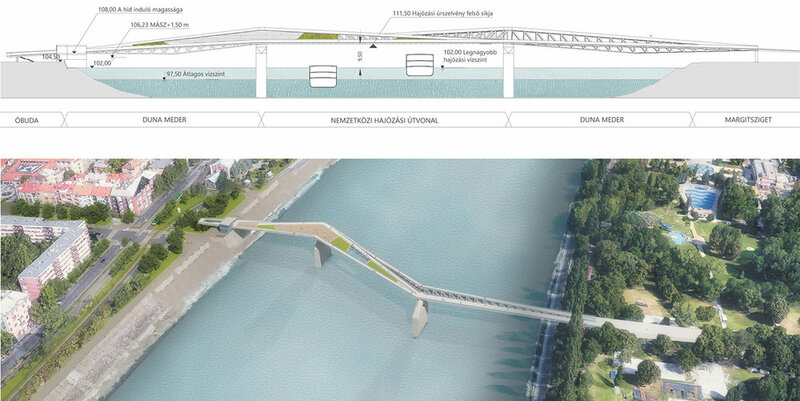 The design is a schematic, we prioritized safety and accessibility during our design process. In order to strengthen regional ties and cultural self-awareness, the water mill of Gúta will also be present among the miniatures within the framework of the SKHU Cross-Border Cooperational Programme. In the abscence of a former historical route to serve as a guideline, we used modern paving in the spa area, while the surroundings of Jenő Mill receive stone covering. In order to bridge some significant level differences in the garden, we installed natural stone retaining walls. Both buildings in the northern parts of the site are accessible by pick-up truck through the economic entrance. For privacy of the nearby residential buildings are enclosed by wooden fencing and lush vegetation. 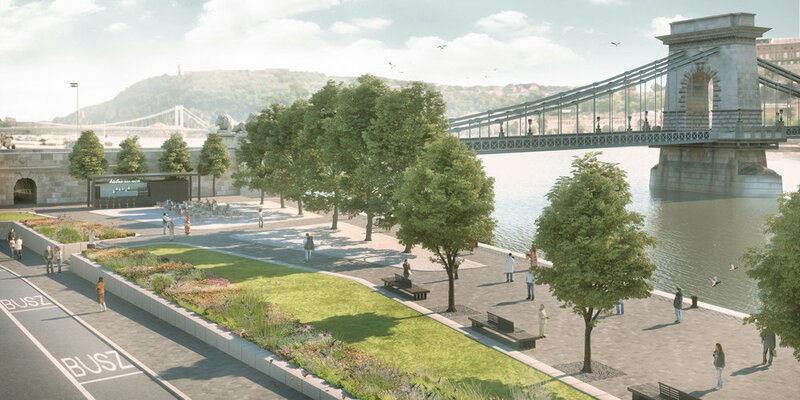 The primary principle of our planning program is to revive Esztergom's unpaved and picturesque promenade back into the one of the city's top tourist destinations, as well as a popular destination for residents seeking relaxation; using both today's toolbox and the historical legacy of the past centuries as design guidelines. The basic aim is to establish, re-interpret the connection with the Kis-Duna, and to take advantage of the potential of this water proximity position. The design of our plan focuses on keeping the area in continuous use, allowing a modular, phased or intermittent construction for each project element. The opportunity of a comprehensive transformation of the entire area will be provided along with the construction of the primary flood protection line on Prímás Island. Since the island will no longer be a floodplain, the expansion of the urban pedestrian network can be extended to the other side of the Kis-Duna. The central element of our concept is the axis of the promenade, however, in order to create architectural and functional unity we included adjacent streets and crossing bridges in our designs. Lead designer: Partner Mérnöki Iroda Kft. Our aim was to highlight the unique landscape values and characteristics of Hegyalja in the bath garden, along with providing a better display and emphasis for the historical significance of the cold water source at the meeting of the mountains and the plain. The source has been described as water with medicinal properties; therefore its importance in local history is outstanding. The park underwent a complex reconstruction, thus becoming the starting point as well as the destination of the touristic route. 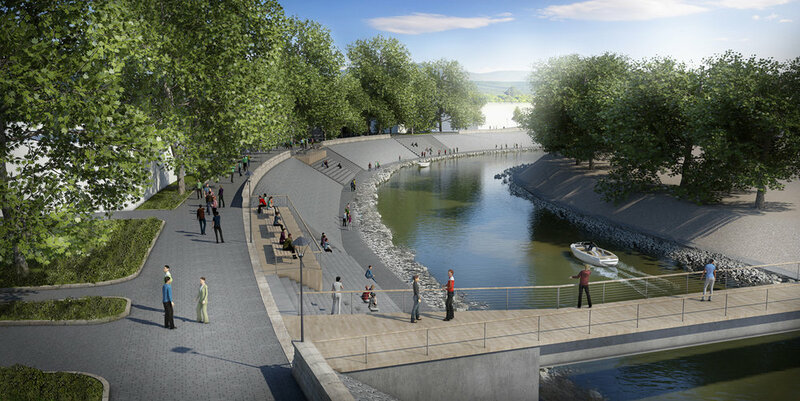 On the hills of Napos-dűlő a resting place and a lookout terrace to the Danube has also been installed within the project framework. The nature trail leading up to Nagy Hill introduces the area’s natural, historic and cultural attractions to the viewer. The nature trail consists of 6 stops, all of them accompanied by a resting area. The design area - a chain of spaces on the Buda side Danube waterfront – is an indispensable historical, cultural, urban and functional part of Budapest. 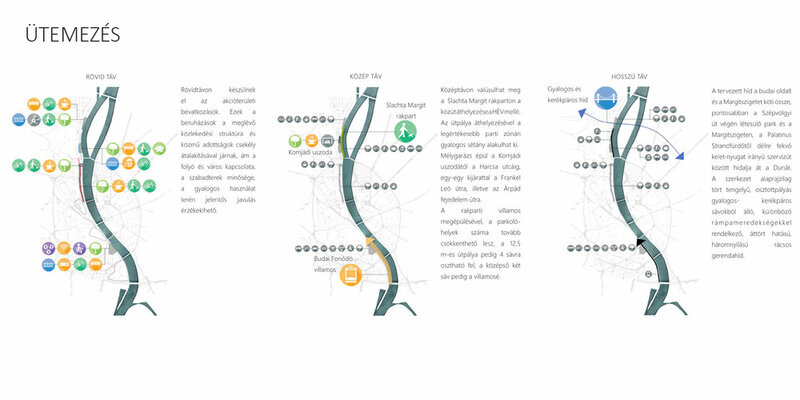 Besides the renewal of these separate entities, we aim to emphasize the relevance of the relationship between the four action areas (Újlak, Felhévíz, Bem tér, Fő Street and Lágymányos) as well. 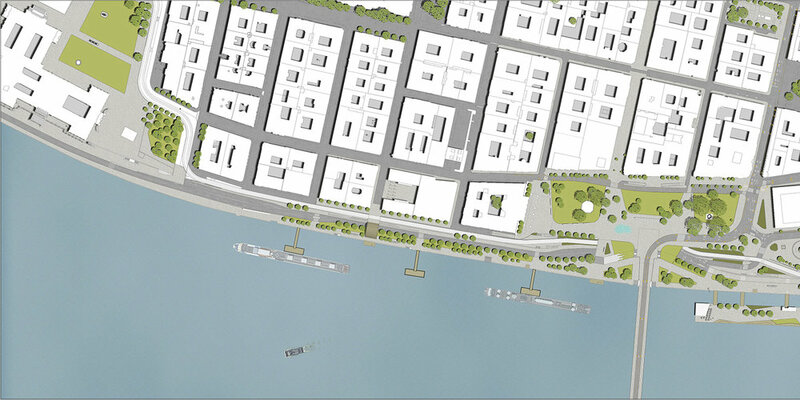 Our interventions focus on the spatial expansion of communitiy areas enriched with new features and functions for a more diverse experience on the waterfront. We found a cost-effective and sustainable way to add quality to these settings, with the consideration of the area’s heritage status. The small scale, interdependent interventions were efficiently sorted together, thus the project can be implemented in a feasible phasing. Our design concept reflects today’s demands, but remains within the limits of feasibility. Our priorities were to meet World Heritage Site criteria and to create cost-effective interventions taking into account the constraints imposed by public utilities. 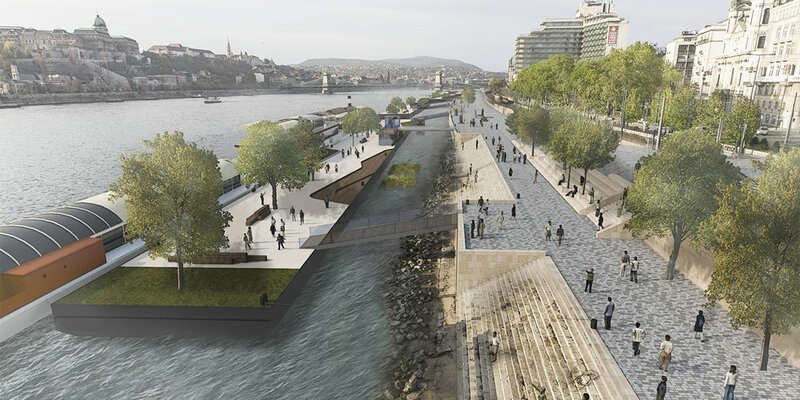 The North-South traffic corridor role of Buda’s lower embankment is secured, whereas the upper embankment is vitalized by a rich network of public spaces that offer an attractive alternative for relaxation and recreation by the waterfront for both locals and tourists. The relationship between the water body and inner Buda is stronger, more transparent.